If you’re like me, and still have a wish list from the new catalogue, now is the time to start shopping! 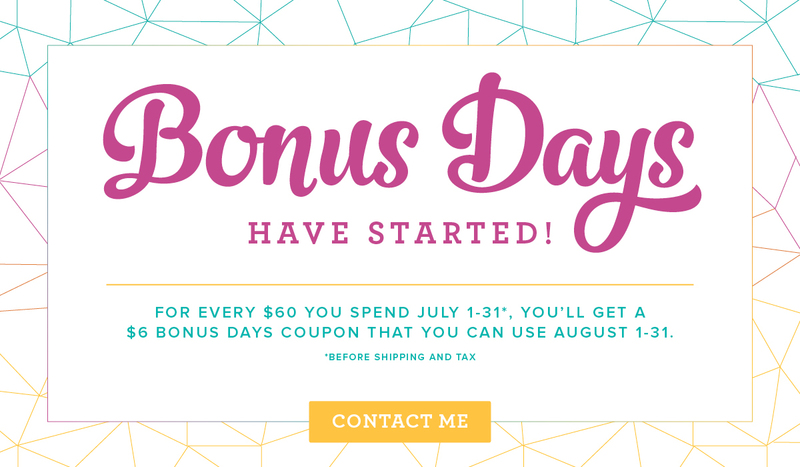 Bonus Days run are every day during the month of July! For every $60 you spend (before shipping/tax), you automatically qualify for a Coupon Code worth $6! You can redeem your Code anytime during August, on any order! When you place your online order, once it reaches $60 you’ll see a pop-up on your screen, congratulating you on earning your Coupon! You’ll be asked to confirm your email address – that’s where your code will be sent. The Coupon Code is emailed directly to YOU, not me, your demonstrator, and the code isn’t retained by Stampin’ Up! So make sure you keep your Code email in a safe place! What If I Spend More Than $60? Lucky you – you’ll get more than 1 code! 🙂 The Coupon Codes are cumulative, so for every $60 increment on your order, you’ll receive another code! Multiple codes from one order will be sent in 1 email. If you place multiple qualifying orders, then you’ll receive multiple emails. How Do I Redeem My Codes? Easy-peasy, Lemon-squeezy! If I’m placing your order for you, simply give me your codes. I’ll enter them with your product order, and $6 for each code will be deducted from your order. If you’re placing your order online, you’ll see a box to fill in your Code. If you have multiple codes, simply input them one at a time. You can redeem all your codes at once, or as many at a time as you want. There’s going to be an Early Release Bundle from the upcoming Holiday catalogue next month! So now’s the perfect time to get yourself some Bonus Coupons, so that you can redeem them next month 🙂 If you don’t want to wait until next month to grab the new bundle, you can Join my Team now, and grab it! You’re still reading?! It’s time to get shopping – Bonus Days have started! Grab some Bonus Codes! Just click on my signature below to go directly to my online store! Previous Previous post: Christmas in July with Free Gifts for You!